When I found out I was pregnant with my first baby, I wanted to buy all new clothes and equipment… until I saw the prices. That is when my cousin told me about children and baby consignment sales. I had never heard of these sales before, but now they have saved me hundreds of dollars. In addition to these websites, you may also want to check out Craigslist, Facebook, or even keep your eyes out for signs along the road.Many of these sales offer the opportunity to shop before the rest of the general public if you are a first time parent or if you have consigned at the sale. I recommend going as early as you can if you are looking for equipment or any large items as these go fast. Then, wait until the last day of the sale — when they usually mark everything down by 50% — to buy any clothes or accessories. This is when I can get the really good deals. In additional to saving me money, these sales have also made me money. I have registered to be a consigner in several of the sales and have sold some of the baby equipment that I no longer need as well as some of my son’s clothes that he has outgrown. With consignment sales you are able to set your own prices and you make a percentage of what you sell (usually between 50% and 70%). This percentage is much higher than what is usually offered in consignment stores. If you are on a tight budget (and who isn’t?) consignment sales are an excellent way to get quality baby clothes and equipment for a fraction of the price. Rachel is a stay-at-home mom who blogs at Third Stop on the Right, a blog dedicated to saving money , living frugally, and using your resources wisely. Here on the South Shore,MA we have a couple of consignment sales that run several times a year. It is a great place to get name brand, almost new baby / Kids clothes and equipment. It really allows you to get more for your money:) I bought my daughter 20+ summer dresses/ outfits some still with the price tags on them for about $60.00. Great deal! Has anyone had success at selling adult clothes? My husband has designer clothes, almost brand new, and has lost 10lbs so they no longer fit! Jaclyn, are you on facebook. If so search “online garage sale in [your town or larger town near you]”. I have had great scucess selling my clothing (adult) through this site. How ours works is that you post pictures and a price and people say they are interested. We then have a meeting place twice a week in an old grocery store parking lot. Everyone has names on their cars and they come and find you. Some people also arrange to meet at different places around town, but I stick to the group meetings. So I would check and see if you have one of those in your area. Look for an adult consigment store, in my area they have Plato’s closet, they have locations throughout the country. Instead of selling them, see if they can be altered. I’ve been doing consignment sales since my oldest child was a baby and now I am able to cloth all 4 of my children for very little out of pocket every year. I’ve also used a lot of the money I make as a consignor to pay off our debt. 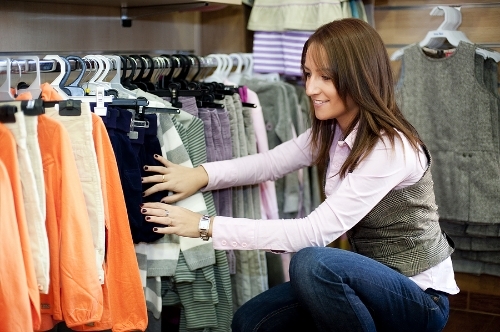 I have a series of posts from my experience with consignment sales. I’ve had very good luck buying at these sales when my son was younger. Be prepared, though, they are not for the faint of heart and you have to have a good morning to yourself to do them well. You can often work at the sales to get in a day early, which is probably worth doing if you have the time. My experience has been that after 3T, they boys stuff gets pretty slim and not very nice. If you have a girl, though, you can still get good deals, but the bigger the kid the the fewer and more damaged the clothes are. I participated as a consignor in my first sale this past spring. The prep work was a little daunting (as was making sure I was buying up enough children sized hangars at the local thrift store!) But I was very pleased with my results! As a first time seller I sold just over 1/3 of my items and netted a check for approximately $300. I’m beginning to prep for the fall sale, doing a little bit at a time so its not so overwhelming at the end, and trying to focus a little better at pricing to sell instead of pricing for profit. I figure the more items I sell, the more profit I make and the less I have to bring home and store for the next sale! I am also volunteering more shifts in order to get a higher payout. It will be a long, but fun weekend and I’m actually pretty anxious! Also, the plan is that the profits from this upcoming fall sale is going to be our Christmas budget. That gives me a little more motivation to sell, and peace of mind that we won’t have to “find” extra money in the Oct/Nov/Dec paychecks for gifts and holiday expenses. Thanks for the tip Mandy! I will definitely be looking into that! If there isn’t a local consignment sale where you live, there might be an opportuity for some extra income by starting one yourself. One place I lived, a few moms got together and started their own local company. I don’t know what their business structure was (partnership vs. single owner, etc.) but they did get free workers for the day of the sale by letting the workers shop the night before the sale opened to the public to get first “pickins”. I’ve also been to a church that ran consignment sales three times a year as a ministery to families in their area. They had a regular committee that planned the sales that ran in spring, late summer (back to school time), and a pre-Christmas toy sale. It was a huge blessing to our family because after three boys we had a girl. We went the second day when things were 50% off and I was able to outfit her for about $20 and got some things that still had tags on.